LOS ANGELES, CALIFORNIA — Like many Southern Californians, I've driven past Ice House Canyon and the Cucamonga Wilderness many times without giving the area much thought. Located at the eastern edge of the San Gabriel Mountains, the 12,800 acre wilderness is well-hidden within the range's deep canyons and gullies. Oddly enough, the Cucamonga Wilderness's proximity to Los Angeles may contribute to its relative invisibility—and not just because it is often veiled behind the San Gabriel Valley's ubiquitous haze. Angelenos can be forgiven for thinking it impossible that such a treasure-trove of alpine terrain could exist right under their smog-filled noses. The area deserves its wilderness designation, however—as only a short journey inward will confirm. Winter had not been kind to the San Gabriel Mountains this season, leaving the mountains dry through most of February '06. Then came March, in like a lion, with a series of storms that opened up what otherwise looked like a busted season. The happy pattern continued into April, which opened with a remarkably cold April-Fool's storm that dropped over two feet of snow all the way down to 5000 feet. With so much new snow on the mountain, I wanted to do a safe tour on moderate, forested terrain. The perfect choice looked to be a lengthy hike up Ice House Canyon to the Saddle, then traversing from 8444' Bighorn Peak to 8693' Ontario Peak. I'd scouted this traverse many times from the summit of neighboring Mount Baldy. Particularly intriguing was the open burn area above 7500', which promised exceptional glade skiing. Parking my car at the lowly 4960' trailhead, I was stunned to see enough snow to put on skis and skins right away. This was a rare treat indeed! Clumps of snow occasionally shushed down from the trees. 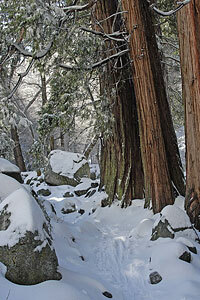 The Southern California sun is awakening; snow at this elevation, alas, will be short-lived. During my long exile in the Los Angeles Basin, the San Gabriel Mountains have been a place of great solace and refuge, and for their company I am most grateful. I skin upwards through the snow, making slow but patient progress, picking my way through rugged, boulderous terrain and forest. 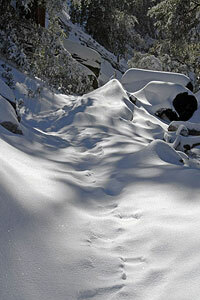 For a few hundred yards or so, I follow the ski tracks of previous travelers who were kind enough to break trail. There are a scattering of residential cabins here and there, as well as the remains of lodgings-past. I pass a grove of large Redwoods (Incense Cedars, I believe). Icehouse Canyon was apparently known originally as 'Cedar Canyon', due to the numerous Cedars which were logged here back in the day. The area earned its present-day name for the ice which was cut from the lower canyon and shipped down to the hot-and-dry residents of the nearby San Gabriel Valley. From the trailhead to Icehouse Saddle is 3.4 miles on my map. My planned traverse to the summit of Ontario Peak via its east ridge will add another two miles to the trip—and a whopping 3700' vertical gain. This will be a big day, I know, made longer by the heavy alpine boots I'm using. I rely on a variety of mental games during these early phases of a tour, when the bulk of the work lies ahead and it's easy to become discouraged. Sometimes, I focus on the rewards to come: light, untracked powder, just waiting to be skied. Sometimes I play songs in my head using a mental jukebox—though there is always the danger of one song getting stuck and playing over and over again. Sometimes I try denial—how far is it to Ontario Peak? 2 miles, tops. I promise.